The nice folks at Workman Publishing emailed me the other day, asking me to try a recipe in the new cookbook "French Classics Made Easy" by Richard Grausman. I must admit, I am a little intimidated by French cooking- it seems rather complicated. As luck would have it, I inherited a smidgen of French from my Mother's side of the family, so I rolled up my sleeves, conjured up my inner Julia Child, and gave it a try. 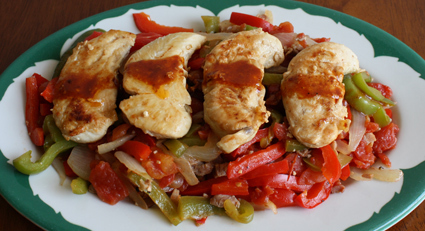 The Basque-Style Sauteed Chicken Breasts were wonderfully flavorful, and easy to do. Preparing the dish was very similar to making stir-fry, with the exception of covering the vegetables with a lid while they cook. The sliced onions, cooking in butter, smelled divine. The prosciutto ham was easy to find at the local deli, and added a nice, robust flavor. As you can see from the photo above, the dish looks lovely on the table as well. Thank you Mr. Grausman for making French cooking easy. I'm thrilled to add French cooking to my list of culinary accomplishments! Thanks for the coverage of my book and recipe. It looks great! One question: Was there more sauce left in the pan or is all you had on top of the chicken breasts? Enjoy FRENCH CLASSICS MADE EASY!